I always figure that the mark of a good party is that no one wants to be the first to leave. By that measure, and many others, the first Strong Towns Regional Gathering, which we held in Plano, Texas last week, was a resounding success. At the end of both days I had to say to people, you know, we have to get out of here and let the nice people who run this venue go home. People were so eager to meet other people who care about the same things: why our cities and towns can’t make ends meet and why we are not building financially resilient places, which, not coincidentally, are also good places to live. Strong Towns made the decision to hold regional events because we know that it’s not enough for us to produce essays about what needs to be done. It’s not even enough for our president, Chuck Marohn, to show people where the money’s going and where it’s not coming from. If we hope to shift the conversation about how we build the places where we live, then we need to connect people who care about these things with each other. We need to get out into the world and introduce these people to each other and provide them with information and inspiration to make changes in their own places. In Plano, we got to hear Derek Avery of COIR Holdings talk about how learning about the Greenwood race attack in Tulsa in 1921 inspired him to work in underserved minority neighborhoods. Derek was a person that many, many attendees wanted to talk to about how they could use his model in their places. Amanda Popken of Amanda Popken Development and John Simmerman from Active Towns not only talked about making places more bike and pedestrian friendly, but actually created a pop-up parklet adjacent to the event venue, where many passers-by who had nothing to do with the gathering got to hear about Strong Towns and what they could do in their own towns. Strong Towns staff members Kea Wilson, Aubrey Byron, and Jacob Moses shared their experiences of being advocates in their own cities with attendees eager to make change at home. All of the presenters provided valuable information and road maps for the changes we need to make, but the real heart of the gathering was the conversations the attendees had with each other and with the presenters. The number of cards being exchanged and plans made to meet up in the future bodes well for change happening in Texas. There is nothing more invigorating and encouraging than finding out there are people near you who also care about the future of their town, and figuring out how you can help each other get things done. Now the people from Waco know that there are people in DeSoto they can call and talk to about small scale development; the developer from Amarillo has peers to consult while negotiating with the city; and the city councilwoman knows who to call when she wants to explain why the city’s current development pattern is not sustainable. And we all had a really good time and ate some delicious food. Connecting people who care and giving them the tools to create real change is how we will build an America of strong towns. We got to do that in Plano last week, and I can’t wait to see what future events produce. PS: For those of you who weren’t able to make it, Chuck recorded his conversation with Mayor Curtistene McCowan of Desoto and former mayor Douglas Athas of Garland, so watch for that to be available on the Strong Towns podcast list. We will also be spotlighting some of the presentations here on the website in the coming weeks. #StrongTownsNTX attendees discuss in small groups their action plans for changing their communities. 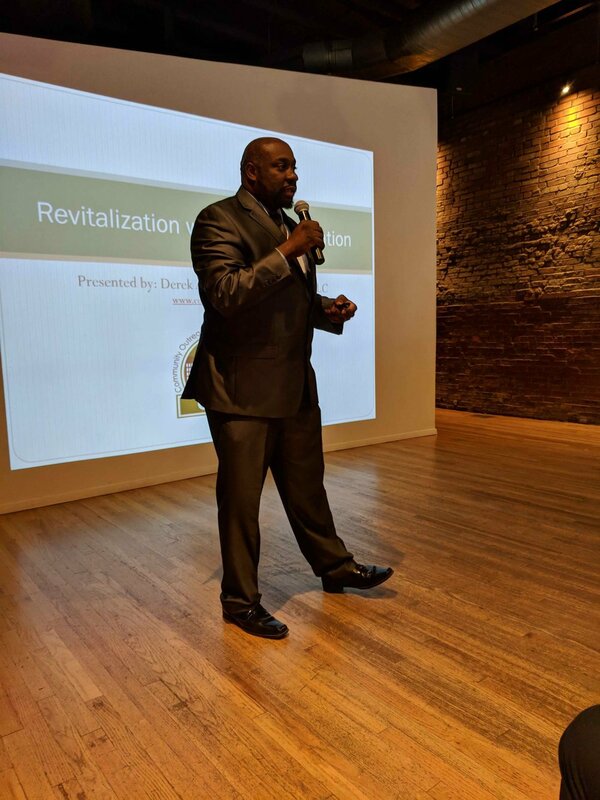 Derek Avery spoke at the recent North Texas Gathering about doing revitalization without gentrification. As a follow-up, we interviewed Avery about his thoughtful approach to community development. Ivy Vann serves as Strong Towns' Gathering Coordinator. She has been fascinated by streets, buildings and communities her entire life. She has been a member of Strong Towns since 2015, when she invited Chuck Marohn to be the keynote speaker for a new planning and development conference she created in New Hampshire. She is certified as a charrette planner by the National Charrette Institute; as an urban planner by the Congress for the New Urbanism; and as a Form-Based Code practitioner by the Form-Based Code Institute. Ivy is committed to making better, healthier, more financially solvent places for everyone by paying attention to historic development patterns and the necessity for beauty in our everyday lives — a commitment which she shares through her own town planning firm, Ivy Vann Town Planning and Urban Design.